Jordan Pughsley, of the Lima Fire Department, takes a shot against the Lima Police Department in the Make A Wish benefit basketball game held at Lima Senior High School on Friday evening. 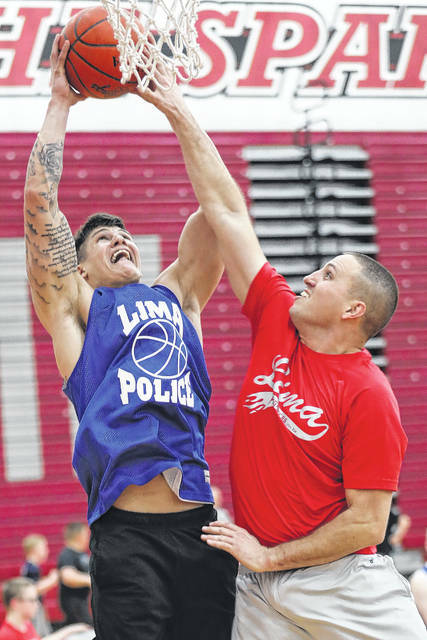 Lima Police Department’s Blake Vanvorce and Lima Fire Department’s Dave Coulter go head to head for the ball in the Make A Wish benefit basketball game held at Lima Senior High School on Friday evening. 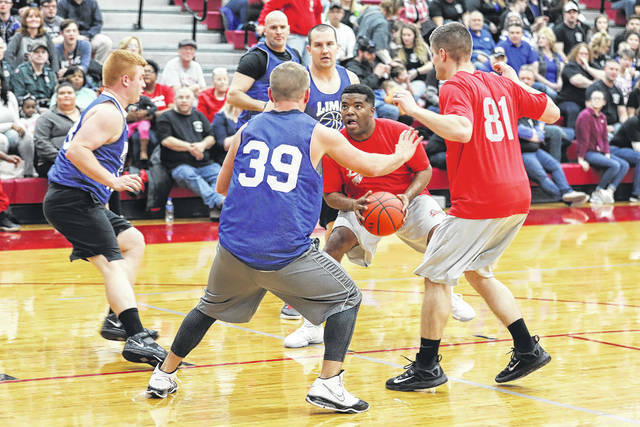 LIMA — It was Guns versus Hoses for a charity basketball game Friday night at the Lima Senior High School Gymnasium. A squad of players from the Lima Fire and Lima Police departments squared off to help the Make A Wish Foundation. “It’s just a great way to give back. To make somebody’s day a lot better and that’s what we’re out here for. We’ve had kids come back that have received these wishes and their wishes have been granted and to hear their story and to see their faces light up is what makes it all worthwhile,” said Justin Wireman, officer with the Lima Police Department. “It’s absolutely phenomenal. We’re making money off of T-shirts, we’re making money off of the bake sales, 50-50, donations at the door. We’ve had people donating online. It all goes within the community so that’s the best part of this whole thing,” said Marc Salas, Lima firefighter. For the third straight year, the Lima Fire Department beat the Lima Police Department, this year the score was 53 to 38. Around 200 area families are on a waiting list to get their wish granted. “We’ve working on two wishes right now in Allen County, one at Allen East and one in Spencerville. We’ve got a couple in Ottawa, Findlay and Kenton,” said Mike Koenig, volunteer wish granter for the Make A Wish Foundation. “We meet with the families and do all of the paperwork and determine what their wish is going to be and we process the paperwork and send it to the Make A Wish office and then they have a committee that reviews it and then grants the wish. We’ve never had one declined yet,” Koenig said. So what do these Make A Wish kids want the most? “Number one wish is going to Disney and trips. We have several going to Disney, one to Hawaii and another wants a customized golf cart so he can sit his wheelchair in the golf cart and go for rides with the family,” Koenig said. So what are some of the more unusual wish requests they’ve received? “More exotic is New Zealand, the Hobbit land, where the Hobbit movies were filmed. We’ve had a couple Hawaii room makeovers. We did a train room for one boy. We built a model train in their basement for them. It took some time. They sent the family to Indianapolis to a Lionel train convention and while they were gone we went into the house and spent three days building this 8-foot-by-24-foot train set and then had a surprise party with the whole family when they returned,” he said.